The second annual #RockTheDots celebration is happening at Disney Springs in Disney World and the Downtown Disney District in Disneyland from January 18-22. 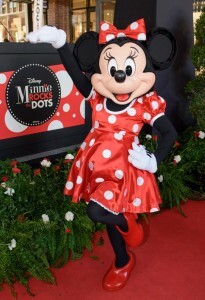 This celebration coincides with National Polka Dot Day on January 21 and is a celebration of Minnie Mouse, too. Guests donning polka dots at Disney Springs and the Downtown Disney District can get special discounts at participating retailers and restaurants including Sprinkles, D-Luxe Burger, Paddlefish, and more. Several locations on both coasts are also serving up special food items including a polka dot milkshake makes a return visit at Uva Bar in the Downtown Disney District, a polka dot pepperoni pretzel at Wetzel’s Pretzels on the west coast, Minnie Mouse ganache lollipops at The Ganachery in Disney Springs, and much more. Paddlefish in Disney Springs is also hosting a “polka dot brunch” on Sunday from 12-3 p.m. Many of the merchandise locations on both coasts are also having special #RockTheDot deals and more. And, the Bibbidi Bobbidi Boutique on both coasts has a Minnie Mouse makeover available this weekend too. Check out all of the details for Disney Springs here and the Downtown Disney District here. If you’re celebrating this weekend, be sure to use the hashtag #RockTheDots when posting photos to social media.